Smoothies are a quick, healthy fast food, that make a great diet meal or snack. Coconut oil adds a delicious coconut flavor and heightens that rich creamy texture we crave. 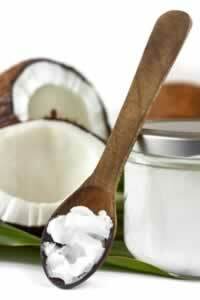 The cholesterol-lowering properties of coconut oil are linked directly to this ability to stimulate thyroid function. Coconut oil raises your metabolic rate, helping to release energy and promote weight loss. Variations:Substitute any ripe fresh fruit in season. If using bananas or frozen fruit, you may want to add almond milk to thin the mixture to taste.